This isn't the first time McDonalds twister fries was introduced. In fact, it had been reintroduced over and over again, sometimes in line with promoting a movie for kids. You can call it a seasonal and promotional food item in McDonalds. The twister fries is actually similar to the regular fries but with a little twist. The fries are literally twisted. You’d also notice a coating which tastes like bread crumbs seasoned with salt and pepper. The latter is even evident in the coating. Recently, this product was reintroduced again with the tag line “Prioritize Twister Fries.” But like previous seasons when it was offered, it was only available within a limited period. Good news for fans! The three-week period is extended until September 16. You can share your thoughts through the McDonalds official Facebook page or by sending a tweet with the hash tag #Extendtwisterfries. 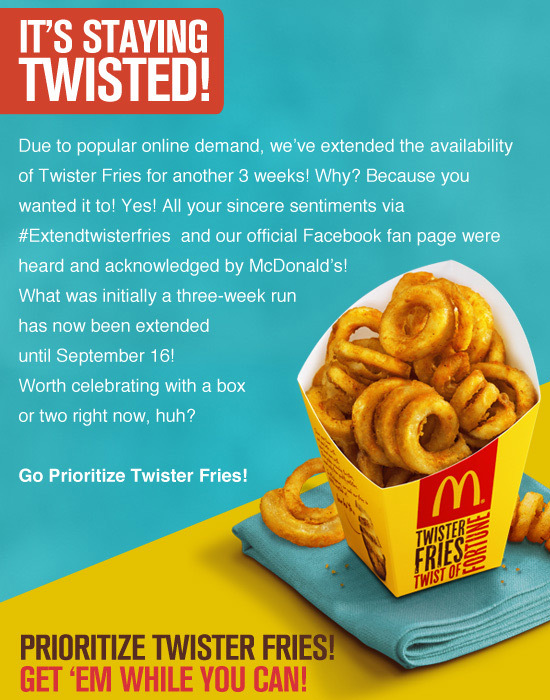 So if you’re a fan of the McDonalds twister fries sensation, take advantage of it now while you still can!